To help the board with the on-boarding process, a customized format can also be utilized. The board then tailors a program that helps the new executive to develop a solid base in the organization and to understand its unique climate and culture. Properly structured, this orientation takes about a year to complete. The board’s time commitment decreases over the course of the year. Major responsibly for the program should rest with the board chair, but it should also involve one or more senior board members. Every custom designed orientation program should include nine steps, either in sequence, or concurrently. 7. Understanding the customers, clientele, membership and stakeholders. Steps one and two are often readily accomplished. The following steps need more detailed explanations because boards do not commonly initiate them. •	Examining Current Policies & Procedures: This is a routine but necessary task. The top administrative staff should be responsible for the new CEO’s orientation on operating policies and procedures, and the CEO will also develop a fuller understanding of such policies and procedures as he/s makes daily operating decisions. However, when it comes to understanding how the board goes about setting policies, the CEO needs a formal “tutorial” orientation from the board chair. The CEO and the board chair should establish a work plan to determine if all board policies are concise, understandable and operationally complete. Depending upon the quality of prior work, this task can be simple or require extensive revisions and additions. •	Developing Staff Relationships: In any organization, top management changes cause staff insecurity and unrest. Old comfortable patterns will be broken. Resistance to change will likely occur. Board members must provide strong support for changes that are needed. Board members should have representation at all business meetings and at other functions where the board traditionally has been expected to participate. •	Fostering Board Relationships: Any astute new CEO will want to get to know his/h board well, and board members should expect a strong leader to assertively develop these interpersonal relationships. One suggestion is for the new CEO to meet individually with board members at their place of employment or another convenient location. •	Cultivating Community or Industry Associations: The board chair needs to assume leadership in helping the new CEO to develop contacts and relationships with community leaders, industry leaders and/or other stakeholders, such as key vendors. The board chair and CEO need to jointly develop a “game plan” to achieve the objectives involved. •	Understanding The Customers, Clientele, Membership and Stakeholders: Through informal meetings, presentations or reviews of pertinent issues, the board should strive to give the new CEO an understanding of how the products or services offered are perceived by various stakeholder groups. The CEO needs to try to verify the information with visits with stakeholders. If a significant gap(s) is noted, the CEO has an obligation to review it with the board to determine if the strategic plan in place is sound or needs modification. •	Discussing The New CEO’s Career Expectations: As part of the hiring process, the board should have an understanding of that individual’s career expectations and aspirations to be certain that these are compatible with the position being offered. The board and the new CEO must agree on a plan for his/h career development and growth, and the board should specify what it is willing to do to help the CEO with the plan. •	Succession Planning: Two plans are needed. One — to cover a situation where the CEO is incapacitated for a period — should be organized quickly. The other, long-term succession planning, a more difficult discussion, needs to take place every few years for the CEO and his/h direct reports. Numerous benefits accrue to having a board-directed orientation program for a new CEO. The most important is the smooth transition that the program promotes. As a result of these efforts, power, authority, leadership and accountability are clearly understood and accepted by both the board and its new CEO. Misunderstandings and conflicts can be avoided. Source: Eugene H. Fram & Robert F. Pearse (1992), “The High-Performance Nonprofit,” Milwaukee, Wisc. Families International, Inc.
← Can A Nonprofit Find Strategic Ways To Grow in Difficult Times? Eugene, you have laid out the key and important steps for on boarding a new CEO. Extremely helpful. 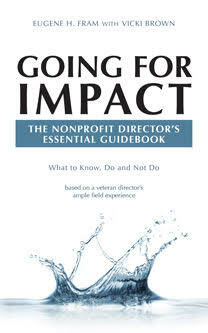 Nonprofit boards have to be quite knowledgeable in delivering on your ideas. Support from other key staff that have a long track record and institutional history can also be very helpful to a new CEO especially if the staff engaged in this process can be objective and not selectively biased. It is important for the incoming CEO to know all the facts, good or bad, so that s/he are not getting a rosy picture and misled from the get go. Solomon: Thanks for your comment. We are on the same page.